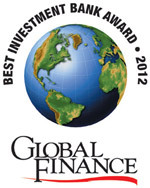 Global investment banks and strong local banks make the list in our annual awards. For an investment bank, success has long been defined as staying true to one’s brand. In general, this means maintaining clients’ confidence in the bank’s ability to raise capital for them and to cobble together mergers and acquisitions. But the definition of success in investment banking changed in the frenetic markets of last year. Investors oscillated between risk-on and risk-off as the world hopscotched from crisis to crisis, dragging down equity market activity overall by 28% from the previous year. Last year saw 40% fewer initial public offerings worldwide than the high-water-mark year of 2007. Many investment banks redefined their own success as “one word—survival,” says Fred Cannon, director of research at boutique investment bank Keefe, Bruyette & Woods. In such treacherous markets, investment banks that were able to raise the most capital—or any capital at all—had large balance sheets that could be deployed on a dime to keep a deal from falling apart. Not surprisingly, the titans of Wall Street had the upper hand in that game even before it started last summer. But the Darwinian nature of last year also favored domestic banks. In countries where investors were the least inclined to take even carefully calculated risks, local banks with strong franchises that had avoided trouble in 2008–2009 grew market share. 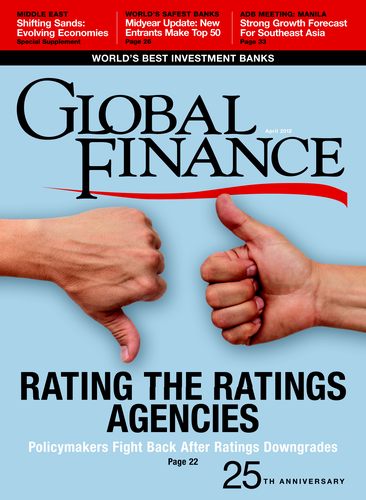 Our selection criteria for determining the world’s best investment banks—how much capital a bank could raise for its clients in such a challenging market, market share, customer service and advice, deal structuring capabilities, distribution network, staff dedicated to investment banking—produced a diverse and interesting array of winners around the globe this year.